New Mount Magmadon Comes with Fiery Magma! 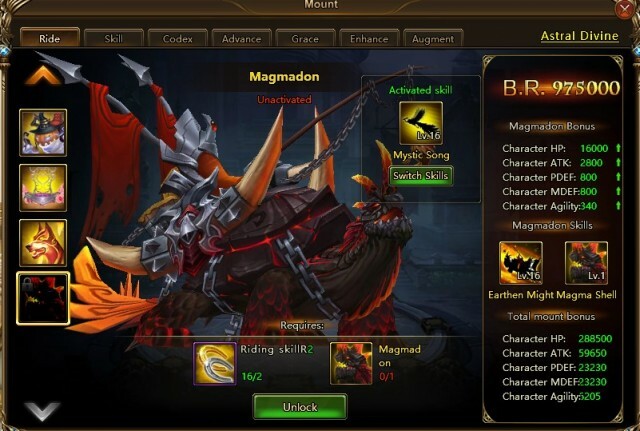 The new mount – Magmadon has awoken from the deep sleep and is now coming to Sapphire! Born and grown in magma, Magmadon has a strong body which can endure the most searing lava. His shell is made of the unquenchable magma from the Great Volcano in the hell, which will not only amplify the endurance to protect Magmadon and the squad from the enemy attack, but also enhance the combat power in the battleground. Earthen Might: At the start of battle, increase entire squad's HP and DEF by 14.5% and Hit by 19% for 5 rounds. Magma Shell: Increase own ATK by 35%; after performing an action, increase own DR by 35% (DR buff lasts until the end of the turn). Magmadon will be available in the Treasure Grab from May. 22rd to May. 24th. Don’t miss this special creature and renewed the battle of glory in Sapphire! And stay tuned for more amazing events in League of Angels II! Next：Angel Athena is Giving Away Special Gifts for the Mother's Day!